Sometimes Windows needs a completely fresh start. Sometimes Windows needs a fresh start—maybe a program’s gone awry or a file’s been corrupted. Luckily, Windows 10 lets you do this with a few clicks. 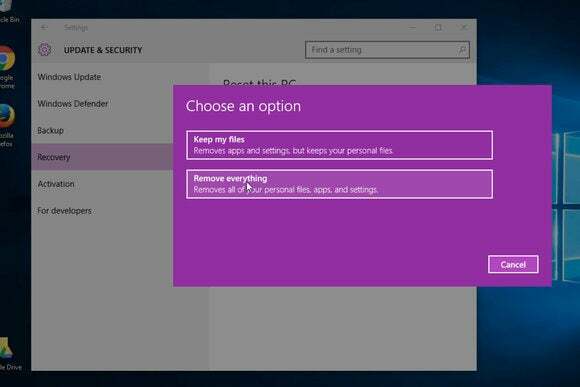 Windows 10 has an option where you can reinstall Windows and wipe your programs, but it keeps your files intact. 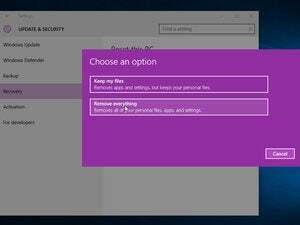 Note that this won’t get rid of any “bonus” bloatware programs your PC vendor put on your computer before you bought it—you’ll have to do that manually—but it will get rid of any software you or someone else installed afterward. Even though Windows says it’ll keep your files intact, it always pays to back up your PC or at least the important files before you do anything like this. At the top of the Recovery section you’ll see Reset this PC. Click the Get Started button—don’t worry, you’ve still got one more step—and then you get to choose an option. In this case, we’re choosing Keep my files, and the dialog box reminds you that this will remove your apps and settings. Then you just sit back and let Windows do its thing. It may take a while. When it’s done, you should have a fresh Windows installation, and unless you’re very unlucky, your personal files will still be right where you left them.